This painting started life as a demonstration for the Stirling art society. I have a particularly unique technique to building up surface texture and I decided to show the good folk of Stirling. Unfortunately it is only a small part of the painting process and as such they were given a little insight, all be it an important one. 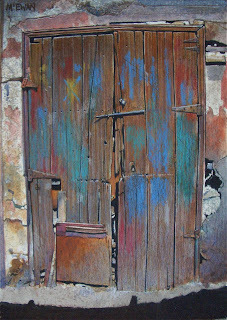 The painting 'Chameleon Door' has been admired by a few people and I personally enjoyed the colours and textures, and believed a close up of the bolt/lock would offer a different point of view of the same subject. 'Standing firm' also has a map of the souks of Marrakesh outlined in gold acrylic and can be seen occasionally if the light reflects off of the surface at the correct angle. It has the effect of being like a gold vein running through the wood, but its not obvious at the first glance, its only revealed through time.